July 22, 2018: Hisense, one of China’s largest consumer electronics companies, adds to its product portfolio and brings new and exciting offers to the streets as the Official Sponsor of the 2018 FIFA World Cup Russia™. In the spirit of football season, the technology giant not only flies 4 lucky winners with fully paid expense trips to the semi-final matches from its mega-raffle announcement. It also launches new products and dazzled the city with its roadshow where everybody is a winner. As part of its promotions in time for the big game, Hisense offered buyers a chance to win tickets to the World Cup games, including 4 x fully paid trips for the semi- final matches in the mega raffle. In addition, a multiplicity of lucky winners won 55/& 65” ULED TVs that offer an immersive viewing experience. In line with its product portfolio expansion, the brand also launched its ULED U7A line of TVs in a 55” and 65” smart TV. The TVs have High-dynamic-range-imaging [HDR] picture with an ultra-motion and depth clarity of 200 SMR (Smooth Motion rate). The sleek, thin metal encased screens are a statement in design & styling. Integrated behind the frame are high-definition twin speaker systems for the best surround sound. The new TVs offer a special interactive Sports Mode, designed to magnify sound and sharpen panned motion in order to give the best viewing experience. “Viewers feel like they are in the stadium and are part of the action while watching the match from the comfort of their home“ says Porus Sheriar – General Manager for Television & Home Appliances at Hisense Middle East FZE. Offering display sizes of 55” and 65” in the ULED range, Hisense is witnessing a spurt in demand. “ We’ve never seen a response as amazing as the one we have had for the ULED TVs during our mega-raffle as consumers rush to upgrade their smaller size TVs to larger ones just before the FIFA World Cup begins” he adds. 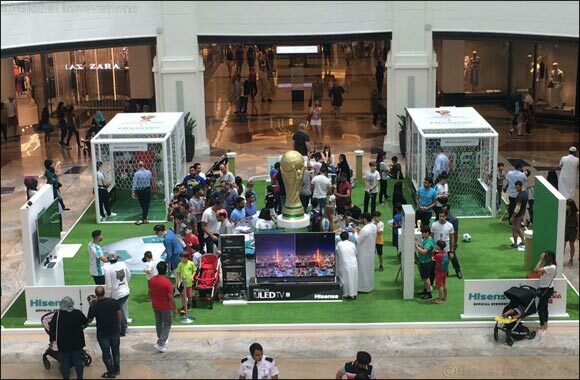 The brand is also hosted its roadshow at Central Galleria, Mall of the Emirates, from the 1st to 10th of July, offering up football merchandise, amazing prizes such as Televisions and much more at the event. The interactive stand, allowed visitors to make virtual as well as manual goals in the Engagement Zone area to win fabulous prizes. Visitors had their pictures clicked in the green-screen photobooth with the World Cup in their hands. In conjunction, Hisense displayed its new product portfolio with the games playing live and continued the festive spirits with new and exciting offers, competitions and giveaways. The company has been number one in Chinese TV market shares for the last 13 years, and its success in China has helped to support the rapid expansion of its international business reach to over 130 countries around the world. It currently ranks third overall in all global TV shipments. As part of its association for the games, Hisense televisions will be the official televisions of the competition. It is expected that the partnership will see Hisense reach over 200 territories and greatly enhance its international brand exposure.